(Francisco Kjolseth | The Salt Lake Tribune) Mayor Jackie Biskupski holds a news conference at the City County building on Tuesday, Feb. 27, 2018, to speak out against SB234 as written, which creates the Utah Inland Port Authority, saying it deprives the city of local control in taxing and land use decisions. Making good on an action she has long threatened, Salt Lake City Mayor Jackie Biskupski on Monday filed suit against the Inland Port Authority, challenging what she sees as its unconstitutional usurping of city taxing and land-use powers. "I have been clear since last year that I believe the State of Utah has violated the firmly established role of municipal governments,“ she said in a prepared statement. She said she felt compelled to act now because of pending legislation that would ban a mayor from taking legal action against the port board. The bill sponsored by Port Authority Vice Chairman and Utah House Majority Leader Francis Gibson is expected to pass and, after previously passing the House, received unanimous approval from a Senate committee earlier Monday. It leaves the decision-making authority over such legal action to city councils. 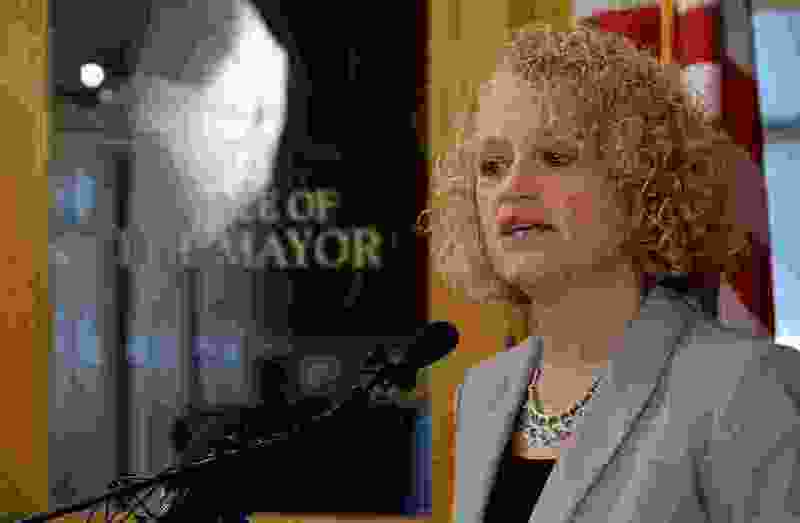 “We had to beat the clock essentially to make sure I had my window of opportunity to represent the people of Salt Lake City," Biskupski told reporters at a news conference Monday evening. The 21-page lawsuit, filed in the 3rd District Court late Monday afternoon, names as defendants the Utah Inland Port Authority; Derek Miller, chairman of the port authority board; and Gov. Gary Herbert. A spokeswoman in the governor’s office said it is the office’s policy not to comment on ongoing litigation. Miller said that the port board will continue its work “unless otherwise directed by a higher authority." “The board is focused on developing the most technologically advanced port through informed and conscious decisions that will create jobs, reduce growth impacts, and economically benefit Salt Lake County and the entire state," he said in a prepared statement, arguing that Salt Lake City’s land use plans would create far greater impacts on the environment and traffic congestion than will occur under the state’s leadership. While the council has since worked to negotiate with the Legislature and the Inland Port Authority Board, the mayor has taken a different approach, boycotting negotiations with the state. She told a group of residents in September that she thinks the bill that created the port development is “unconstitutional” and would face a legal challenge. But that litigation wasn’t expected to come from the mayor, since the City Council in June had banned Biskupski from filing a lawsuit over the inland port unless she first obtained the council’s permission. Biskupski dismissed assertions that the litigation was filed because of her own political interests and said she had received outside legal counsel stating that she did not need the council’s permission to bring forward a lawsuit and that they would need to take legal action to stop her. She hoped the council would not take that route and called on its members to support her decision to litigate. Council Chairman Charlie Luke told The Salt Lake Tribune on Monday night that the council was reviewing its options related to the suit but would continue to collaborate with the port board and the Legislature. Ultimately, Rogers argued, threatening litigation is not a good negotiating tool. Biskupski is in the thick of what could be a tough re-election race, with early poll numbers showing she could be in trouble. Among several challengers are former state Sen. Jim Dabakis, Latino businessman David Ibarra and former Salt Lake City Councilman Stan Penfold. Senate President Stuart Adams, whose chamber will have the final say on Gibson’s bill, expressed disappointment over Biskupski’s decision to sue and said he hopes disagreements over the inland port development can be resolved. Port opponents have long raised concerns about how the project, which is expected to bring increased rail, truck and air traffic along with tailpipe emissions, will impact the environment, including air quality and the Great Salt Lake’s fragile ecosystem. Richard Holman, the co-chairman of the Westside Coalition, and former Salt Lake City Mayor Ted Wilson echoed Seed’s sentiments. The lawsuit argues that the state violated the Utah Constitution in awarding the Inland Port Authority Board — which it says is “not elected by and accountable to the residents” — unlimited power to make land-use decisions in the city and to take its municipal funds. It also contends that the bill passed last year “effectively creates a city or town,” which the Legislature is prohibited from doing. The lawsuit notes that the inland port area, which also includes a piece of West Valley City and of Magna township, is larger than major municipalities such as Draper, Ogden, Sandy and South Jordan. The city administration ultimately seeks an award of attorney’s fees and legal costs and a judgment that the power given to the authority to reverse municipal land-use decisions and to take up to 100 percent of the tax increment violates the state constitution. Biskupski said it wasn’t clear what the financial impact of a suit could be on the city. She also noted that it’s possible the state could retaliate by pulling funding.